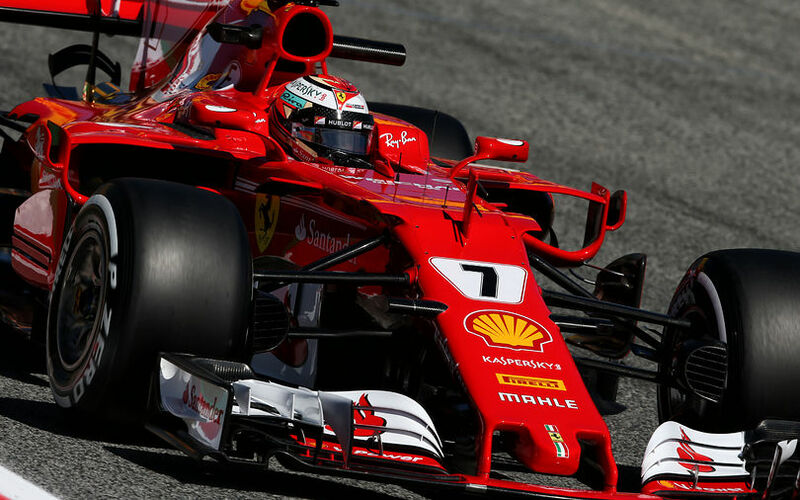 The Spanish GP, which has kicked off the European leg of the championship season for many years now, usually serves as a showcase of the first big upgrade packages. This year was no exception in that regard as many teams introduced raft of updates on their cars. The world champion team shocked the world with the scale of its upgrade package. The Anglo-German team brought a car which could be called as the B-specification of its first machinery. The biggest change visually is the car's narrow nose, which obviously had to undergo a separate crash test before it could be used on track. The narrower version means there is a well-marked transition at the front bulkhead, where the detachable nose cone meets the front end of the chassis. Under the nose section, there is a very elaborate turning vane, already nicknamed 'teddy cape', to manage the turbulent wake of the front wing. The way Mercedes engineers are paying attention to the details is clearly showed how the camera mountings were updated for this race. The construction of those mountings, and the exact position of the camera hubs are tightly regulated, but Mercedes still found a way to create slender mountings that provide the least possible obstruction to airflow passing aside and just on top of the nose cone. Similarly at the front, the brake ducts evolved, with a different 2-element winglet now present on the suspension support arm, along with a revised shape of the inlet fairing. The team brought a new rear wing to Barcelona which features different main- and endplate to meet the aerodynamic requirements of the high-downforce track. The floor also underwent changes. Two additional fins were added to the underside of it in front of the line of the sidepods. Other fins were added to the already very complex, serrated outer edge of the floor right in front of the rear tyres. The team also added a monkey seat to the rear to the car which aims to creat the perfect connection between the rear wing and the diffusor. Mercedes also worked on its engine. It brought an updated power unit to Barcelona. The upgrade is aimed to improve the reliability of the Mercedes W08 EQ Power+. It can, however, have an impact on the power as well since it can allow the drivers to use the power unit closer to its maximum for a longer period of time in race conditions. Both drivers got new internal combustion engines, turbochargers, MGU-H and MGU-K units which are all only their second of the season. However, Valtteri Bottas had to revert to its previous ICE before qualifying. He later blew that engine, which was used in the first four races of the season, during the race. Having been overweight at the start of the season - partly due to an overweight gearbox - the team focused on shedding some of that. 3kg was reportedly shaved off with the Barcelona update. Ferrari’s technical leader Simone di Resta follows the development path of smaller updates. The team introduced a raft of upgrades in Bahrain, so the Spanish GP was always going to be a moderate step for the SF70-H in terms of development. In Barcelona, Ferrari introduced a new bargeboard which is slotted with two cuts. Even with this serration, Ferrari is a long way behind Mercedes’ highly-serrated bargeboard configuration. The Maranello-based team also modified its T-wing. The new one is a completely redesigned version to the previous one. It is now a McLaren-like double U-wing which work the air flying towards the rear wing even harder. It is a balancing act as the bigger, more complex configuration causes more drag. The Italians copied the cover Mercedes mounted onto its rear crash structure. It is a curved element which directs the exhaust gases upwards. It helps the diffusor to work more efficiently. Williams had a pretty rough weekend in the Spanish GP. It is not only reflected by the end results, but also by the speed of the team’s 2017 challenger. Massa managed to make the jump into the last qualifying segment, but the Brazilian lost its place of the best of the rest behind the trio of Ferrari, Mercedes and Red Bull. Williams brought only a small upgrade package to Barcelona. It included s slightly modified duo of shark fin and rear wing pillar. The two are now connected to make the shark fin more resistant to vibrations. The Grove-based team modified its T-wing. It is now connected to the shark-fin-like engine cover. It gives more stability for both elements. The T-wing itself was also reworked for the first European race. The new version consists now of two surfaces, both separated into two edges. Red Bull which started the 2017 championship campaign with a rather significant pace deficit to the field-leading Mercedes and Ferrari was expected to kick off its season with a tremendous upgrade package in the first European race of the year. However, the energy-drink owned team disappointed with its package despite to the voices from the team that the RB13 would undergo a thorough modification. The new package included a series of small modification and only single visibly big change. The former very simple bargeboard was redesigned completely. It is now a three-element, sophisticated, curved configuration which feature a curved horizontal vane and four Mercedes-like blades. The Woking-based team did not introduce a thorough development package in Spain as it brought a series of upgrades over the last GP weekends. The team brought a new front wing which had a slightly modified upper flap, but this did not was raced in the end. McLaren is the only team which use an underfloor which does not feature any slots in front of the rear tyres. The team brought a modified underfloor to Montmelo which followed that pattern, but a new rectangular element was mounted onto its upper surface right in front of the rear tyres.